Sometimes my designs start with the simplest of ideas. This one started with the card. I love the idea that the design is created with the union of both the inside and the outside of the card. I like it even more because the insert can be used on its own as a note card (maybe a thank you card if you have your own house warming party?). The box is very simple to assemble with a two piece design and ribbon closure. You can beat stylish and easy! 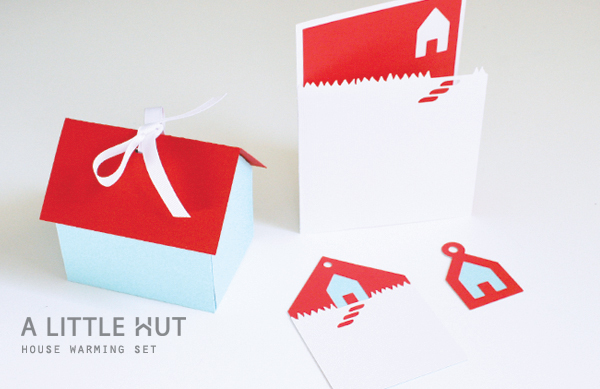 The whole House Warming Set is now in the shop. Reminder! My daily freebies will be over on Easter (then we'll go back to weekly) so we're in countdown mode. Don't forget to check every morning. Don't miss out!